People use dry basil for stronger flavors. Drying basil lets you prepare summer dishes in cooler months. It’s handy to have a supply when they are out of season. There are a couple of ways to dry them, but using the oven or dehydrator stand out. Before proceeding, consider the careful ways to collect, dry, and preserve basil leaves. Harvest basil leaves during the early morning when the sun has dried the dews of dawn. Cut a quarter of an inch above the node. This makes allowances since the basil leaves shrink as they dry. Basil leaves have a healthy bright green color. Pick away stems and some leaves that don’t look fresh. These parts will burn in the oven and ruin the flavor you would want in dry basil leaves. Wash them at room or outside temperature. Scalding water may shock basil leaves and cause them to curl. You could also soak them in water with a bit of vinegar for about ten minutes. This kills the bugs and bacteria on the surface. Pat them dry with tissue or paper towels. Wet basil leaves are prone to molds. Using the oven is an easy way to dry basil leaves. Preheat your oven to the lowest temperature. Set it to 175 degrees (F), or if you’re in a hurry, to 250 – 300 degrees. Just keep in mind one thing – higher temperature increases the risk of burning the leaves! Place basil leaves on a tray with a cookie sheet. They should be separated with even spaces. If they are too big, you can chop them into short pieces. Place them on the top rack of the oven. Leave them to dry for about four to six hours. This may depend on the setting. Check every hour to see if they are dry enough. Take them out and crumble one to test if they are ready. Leave the ones that are moist for another hour or so. Crush the ones that you have gathered in a bowl or inside plastic bags. Funnel them in a jar or leave some on the bags for storage. The simplest way to dry basil leaves is using a dehydrator. Start at 95 degrees (or herbs setting on your dehydrator). Wait until the basil is dry, you will know when it snaps and crumbles easily. Depending on the humidity of basil leaves, the drying process will take around 12 hours (in some cases it might take up to 24 hours). Check the leaves after every 4 hours. Separate the basil leaves into groups and bundle them with a rubber band. Cover them using a paper bag that has holes to allow air circulation. This prevents the growth of mold. The paper bags also protect them from dust and insects. Keep basil leaves away from sunlight to avoid their colors fading. The temperature must be warm and humid for them to dry. You can do this in an attic or a shaded part of your porch. This process could take about two weeks. Another method of drying basil leaves is to lay them on top of racks outside for the sun to dry. Place a parchment paper on the bottom of the rack to catch dry pieces that might fall through the slips. Install screens to keep debris and pests away. This is the quickest way to dry basil leaves. However, it is not recommended to use the microwave for drying basil. It breaks down the oil inside the leaves. Place the basil leaves on a plate and put inside a microwave. Set timer for thirty seconds. Turn them over and redial. Continue until basil leaves are crumbling. The safest method is to dry basil in the oven. It’s a shortcut if you need dried basil leaves right away without harming the oils inside. You avoid all the risks you would have to watch out for in other methods. There is little to no risk of mold growth and bleaching. There is a probability of burning, but that’s pretty low as long you keep a close eye on them. 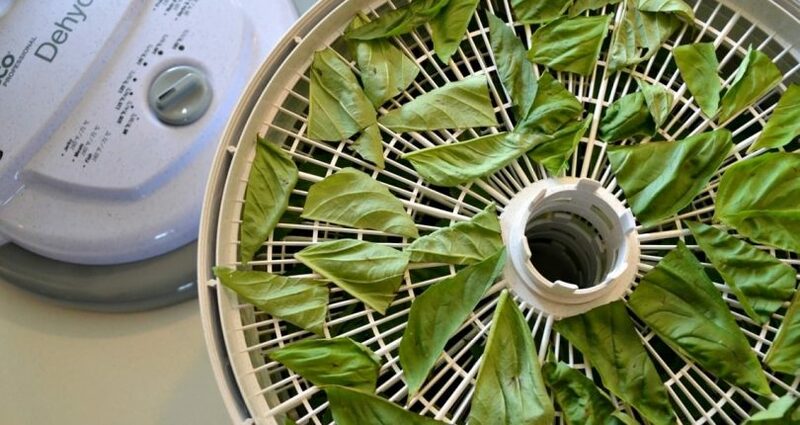 You should use the dehydrator for big batches of basil leaves. If you’ve only got a few, go for the oven. Storing basil leaves will preserve the rich flavor. Avoid direct sunlight. Preferable locations are cupboards or in the freezer. You can also puree them for dips and dressings. Blend two handfuls of dried basil leaves with garlic, olive oil, and sea salt. Add in three cloves of garlic and half a cup of extra virgin olive oil into the blender. Start it, and add in the first fistful of basil leaves. Follow with another. Sprinkle the sea salt. Puree until the mixture turns into a smooth paste. This is an optional storage method. You can do this first before storing the dry basil leaves. When you immediately blend dried basil into a puree, the flavor tastes fresher. Don’t let basil leaves to flower. This will affect the taste. Basil leaves have the most oil before the flowering stage. Harvest them before that happens. Air needs to pass through both sides of the leaves to prevent molding. Metal trays may burn basil leaves in the oven. Place a baking or cookie sheet on top of the tray to prevent this. Do not overlap dry basil in the oven. There should be spaces between leaves. Always store dried basil leaves in an airtight container away from light. You can dry picked basil leaves right away, but you can also store them in the fridge for later use. This can happen if you have a big harvest. Dried basil leaves last up to one year. They are still good afterward, but they lose their flavor and fragrance as time passes. The flavor of dried basil leaves is rich. When you dehydrate them, the water leaves and the oils and flavor remain. If you want to use dried leaves for teas and tonics, do not crush them right away. Doing so releases the oil that contains aroma. There are other methods of drying basil leaves, but using the oven is your best option. You won’t have to wait for weeks checking up on their progress. You also won’t lose any of the moisture by using quicker methods. Drying basil leaves keep their flavor intact for longer periods. 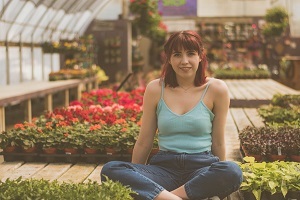 You can bite into a taste of summer even when the temperature drops, as long as you store them.